Engine: C.2-cyl (285ihp) by A. & W. Robertson & Co, Victoria Docks, London. 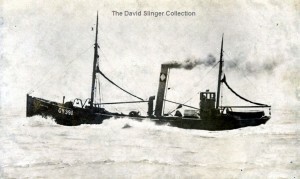 1.1891: Launched by A. W. Robertson & Co, Canning Town, London (Yd.No.44) for The International Steam Trawling Co Ltd (64/64), Grimsby as LYNBROOK. 23.9.1891: Thomas Baskcomb, Cleethorpes designated manager. 23.9.1891: Vessel mortgaged (64/64) to George Doughty, Grimsby for the sum of £2,000 with interest at 6% (A). 28.9.1891: Registered at Grimsby (GY391). 15.10.1892: Vessel mortgaged (64/64) to The Marine Securities Corporation Ltd, London (B). 31.12.1895: Vessel mortgaged (64/64) to The Law Guarantee & Trust Society Ltd, Lincoln (C). 8.1.1896: Mortgaged to The York City & County Banking Company Ltd, York (D). 5.6.1898: George Doughty, appointed manager. 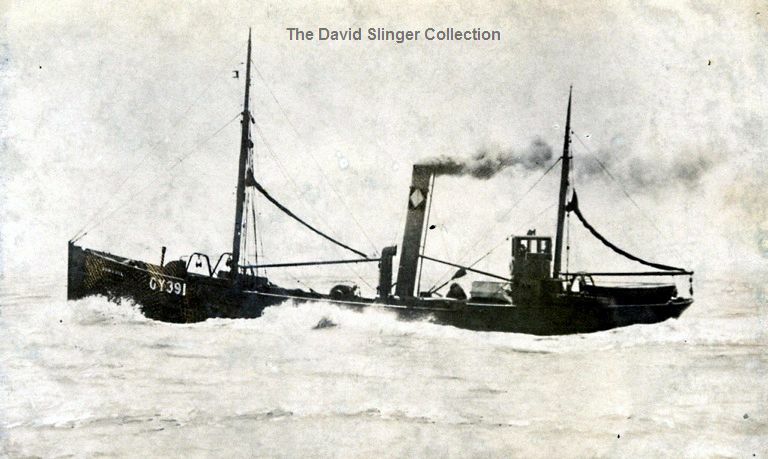 30.6.1898: Sold to The North Eastern Steam Fishing Co Ltd, Grimsby. 30.6.1898: Vessel mortgaged (64/64) to The Law Guarantee & Trust Society Ltd, London for sum on account at 4% interest (E). 5.7.1898: Mortgages (C) & (D) discharged. 27.11.1902: Tonnage altered to 49.24 net following alterations and survey dated 26.11.1902. 1902: Re-engined with T.3-cyl (300ihp) by G. T. Grey, South Shields. 1902: Re-boilered with boiler (185lbs) made 1900 by Schofield, Hagerup & Doughty Ltd, Grimsby. 27.11.1902: Registered at Grimsby as JONQUIL (GY391) (R.S.S. Minute 21909). 15.11.1907: Mortgagee re-styled Law Guarantee Trust & Accident Society Ltd, London. 31.12.1908: Vessel mortgaged (64/64) to The Law Guarantee Trust & Accident Society Ltd, London (F). 1.1.1914: Tonnage altered to 54.17 net under provision of Merchant Shipping Act 1907. 26.1.1914: Mortgage (F) discharged – The Law Guarantee Trust & Accident Society Ltd, London in liquidation. 12.5.1914: Henry Morris designated manager. 26.11.1919: The North Eastern Steam Fishing Co Ltd, Grimsby in liquidation. Arthur John Downs, Grimsby appointed Official Liquidator. 1.12.1919: Vessel mortgaged (64/64) to Barclays Bank Ltd, London (G). 2.12.1919: Thomas William Baskcomb designated manager. 22.10.1935: Sold by order of the mortgagee under mortgage (G) to Fred Parkes, Fleetwood. Basil Arthur Parkes, Cleveleys designated manager. 24.10.1935: Sold to Consolidated Fisheries Ltd (64/64), Grimsby. Sir John D. Marsden, Bart designated manager. 4.11.1935: Registered at Lowestoft (LT94). 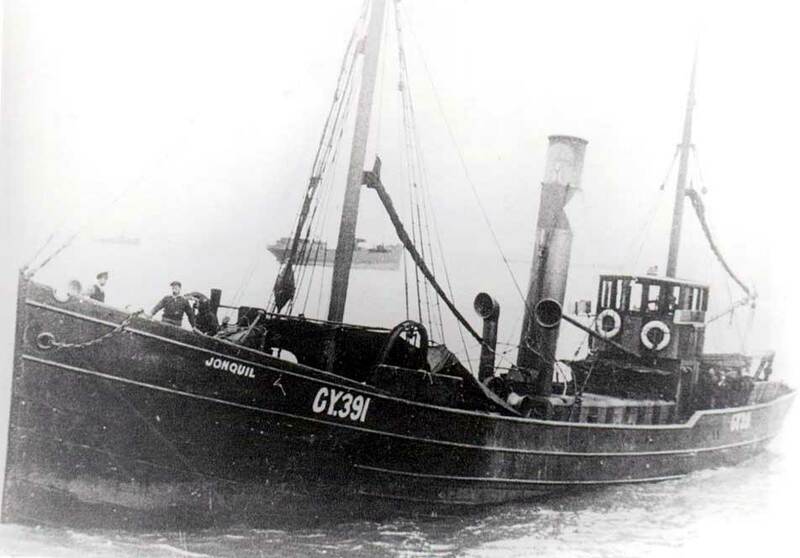 17.11.1935: Vessel transferred to Lowestoft. 1953: Sold to BISCO and allocated to Thos. W. Ward Ltd, Sheffield for breaking up at Grays, Essex. 11.5.1953: Sailed Lowestoft for London River. 16/10/2017: Removed FMHT watermark and updated information. This entry was posted in Non Fleetwood Vessels, Steam Trawlers, Steamers (Picture) and tagged Parkes on June 14, 2010 by Fred Smith.